This week 30-year-old female orangutan "Mekar" (lovingly named after the village in which she was found, which means "blooming") was found trapped, skinny and bullet-ridden in a small patch of forest inside a palm oil plantation for over seven days. Arboreal creatures sharing 97% of human DNA, orangutans are not able to thrive in palm oil plantations due to lack of food and tree cover, but the reality is that palm oil plantations are both a norm and a way of life in Sumatra, posing a great threat to wildlife and conservation efforts. When critically endangered orangutans are in trouble in Sumatra, people know who to call: "HOCRU," or the "Human-Orangutan Conflict Response Unit," which operates as a part of Sumatra's leading orangutan and habitat conservation organization, "Orangutan Information Centre (OIC)." "Mekar" had been trapped in this tiny patch of forest for over seven days. Mekar was safely tranquilized using a dart gun. It took three tries to hit the orangutan in a tree 15 metres above ground and after she was sedated, she fell into a net held taught by the HOCRU team and the help of locals. Local people from "Mekar Sari" watch and assist in the rescue. 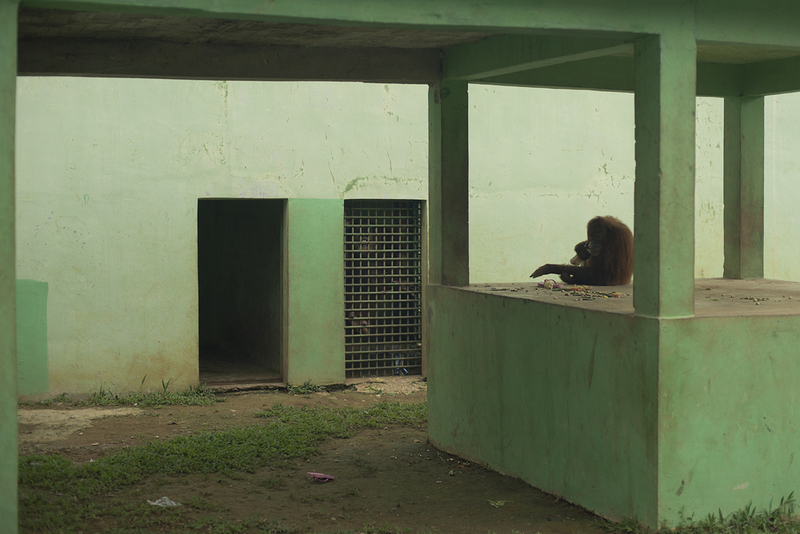 Kriezna, the HOCRU Coordinator, tries to coax the orangutan into a better position for tranquilization. A different kind of White Helmet team wait for the sedative to take effect. OIC's vet, Ricko al Husein, and the HOCRU coordinator Kriezna Ketapel did a check on her vitals and found that she was malnourished with over 30 air rifle bullets riddled throughout her body and face. One eye had a bullet lodged inside, impairing her vision. Fortunately Mekar was healthy enough to be translocated to the national park on the same day, so the team made preparations to drive two hours to the nearest release site at the national park entrance. Releasing Mekar to the National Park forest. Orangutans viewed as pests on plantation sites and in villages are often shot, killed, and even sometimes consumed or kept illegally as pets. Poachers are also notorious for killing mother orangutans so they can capture and sell their babies as pets to foreigners and locals where they are seen as status symbols. HOCRU evacuated or confiscated 28 isolated or illegally kept orangutans in 2016. However by educating local communities and building partnerships with local people, OIC is getting more and more calls so that these magnificent beings can have a second chance. Sumatra is the only place in the world where critically endangered orangutan, elephant, rhino, and tiger exist in the same ecosystem. And the largest culprit causing the need for rescues and pushing these animals towards extinction is habitat loss due to deforestation. Unsung heroes, the staff at OIC are not only the sole organization performing rescues and translocations, but they have reclaimed and reforested almost 1500 hectares of illegal palm oil plantations that encroach on conservation land, and are creating buffer zones between the national park boundaries using coffee and orange farms. Right now one of their key aims is purchasing land to create a conservation area called the "Sumatran Wildlife Sanctuary" that will act as a migratory corridor and safe haven for wildlife that can not be returned to the wild. They key to their success? Involving and working with local people, government and NGOs.